I was able to find some time to implement much of the paint mixing and inventory system. These enhancements are now live with the latest patch (0.0.7). The paint shelf now scrolls left and right to accomodate essentially an infinite number of paints. 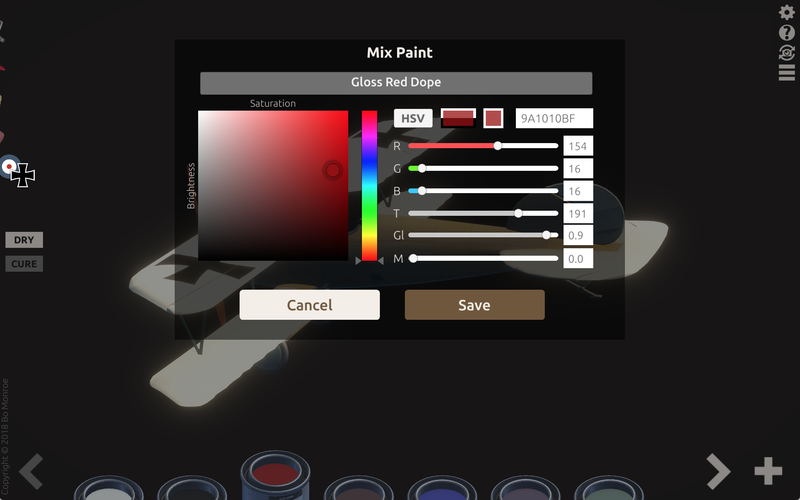 You can editing existing paints by shift-clicking on the tin; you can then modify not only hue, but also the paint's translucency, gloss and metallic properties. You can also add entirely new paints to the shelf, by clicking the "+" button. Note that the colors you create are not currently saved when you quit. That should be addressed with the next update. Also with this update -- help text that might actually be helpful!